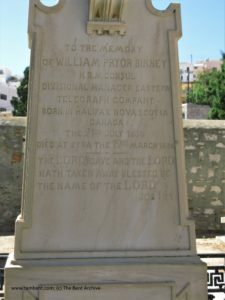 I was prompted to write more about the ‘Syra British Cemetery‘ after reading Gerry Brisch’s fascinating account of the life of one the Bents’ friends and key ‘fixers’, Her Britannic Majesty’s Consul to Syra, William Binney, who helped ease the Bents’ travels around the Cyclades by way of letters of introduction to mayors, priests and other prominent figures throughout the islands. 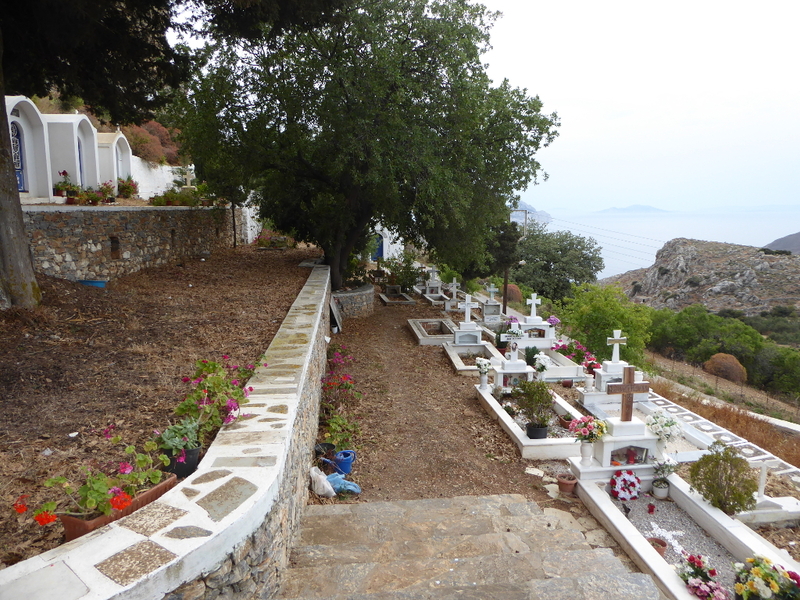 These days, the island of Syros doesn’t figure too prominently on the radar of many non-Greek visitors to the Cyclades, and the three cemeteries, Orthodox, Catholic and British, on the road between the lower town and the ‘Catholic’ upper town, receive even fewer visitors. 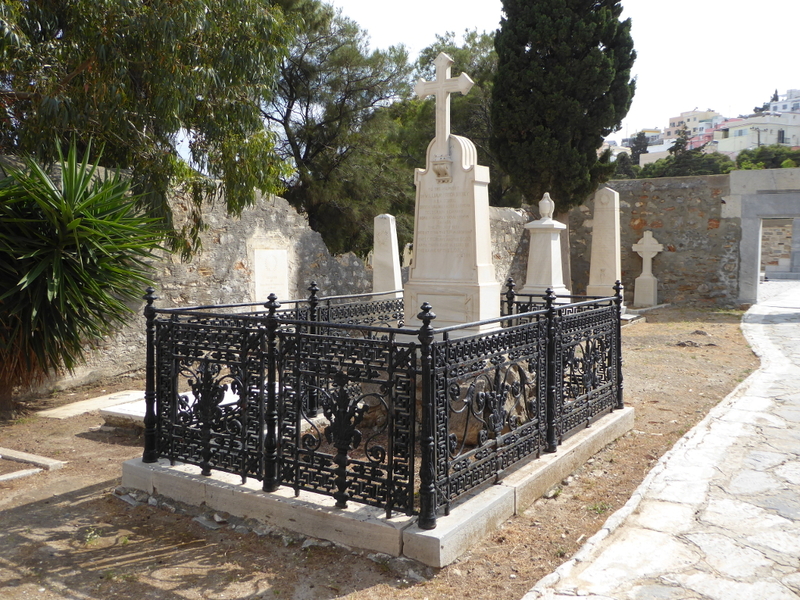 The ‘Syra British Cemetery’ illustrates the importance of Syros to Her Britannic Majesty’s Foreign Office following the foundation of the modern Greek state in 1832, until its pre-eminence was later eclipsed by King Otto’s new capital of Athens and its port of Piraeus. Like other British overseas cemeteries, located in many a corner of a foreign field, the Syros cemetery reveals some of the human sacrifices of those who served the Empire and suffered sickness and death far from home. 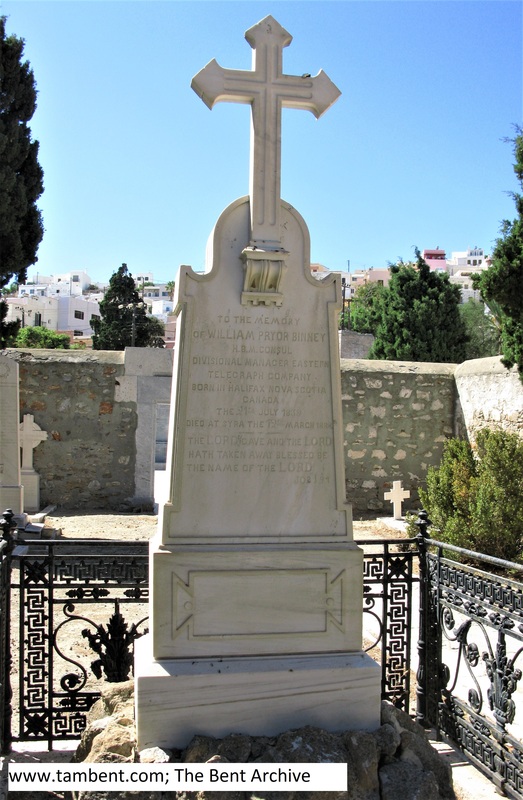 died at Syra the 12th March 1888. 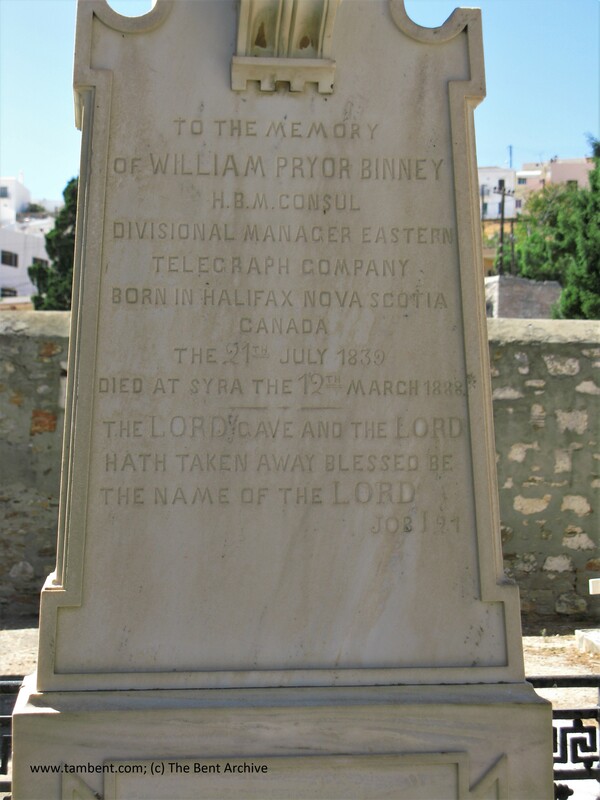 Although the grave of HBM Consul William Binney, is the grandest in the tiny cemetery, there are also the graves of two former British consuls. 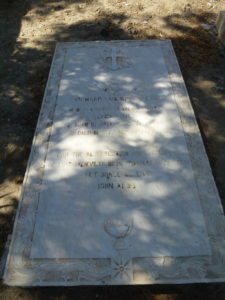 Sacred to the memory of St. Vincent Lloyd Esq., for many years H.B.M. Consul Syra, who died here 25th February 1884, in the 74th year of his age. 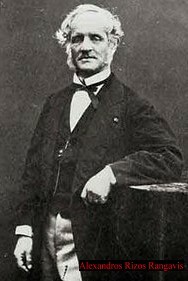 Lloyd’s promotion had been prompted by the death of another HBM Consul in Syra, Richard Wilkinson, in 1861. Two Wilkinson graves tell the story of tragic family grief. 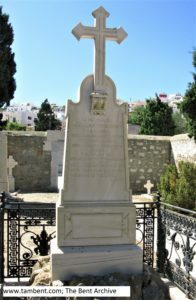 Richard Wilkinson had been born in Smyrna, now Izmir, in 1783 and died in Syros on 26th September, 1861. 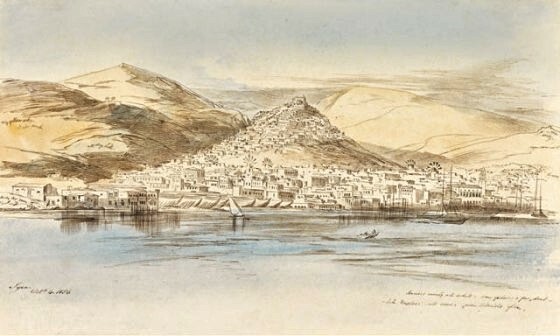 Records exist showing him as HBM Consul in Syros in 1838 , one of five consuls stationed in important cities throughout the fledgling Greek state, the others being in Patras, Pyrgos, Napoli and Piraeus. 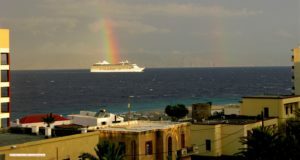 With the exception of the Patras Consul, their role was primarily trade, highlighting the commercial importance of the island of Syros at that point in its history. 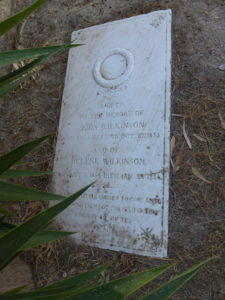 The other Wilkinson family grave holds the tiny bodies of John Wilkinson and Helene Wilkinson; John died in October, 1855 aged just over 2 years, while Helene survived just a few days over 3 months of age and died in January, 1856, three months after the death of her elder brother. Were they Richard Wilkinson’s grandchildren, or possibly even his own children conceived late in life? Either way, the grave evokes a time of great sorrow for Richard Wilkinson and his family. 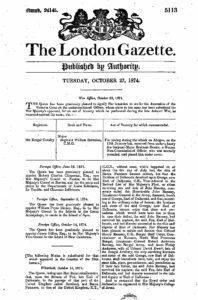 During the First World War, Britain was fighting in two campaigns in the region, one against the Turks at Gallipoli, the other against the allied German, Austro-Hungarian and Bulgarian forces on the Macedonian front. The seaborne lines of communication and supply for these campaigns ran through the Aegean Sea, and the islands of the Cyclades were a favourite hunting ground of German submarines. 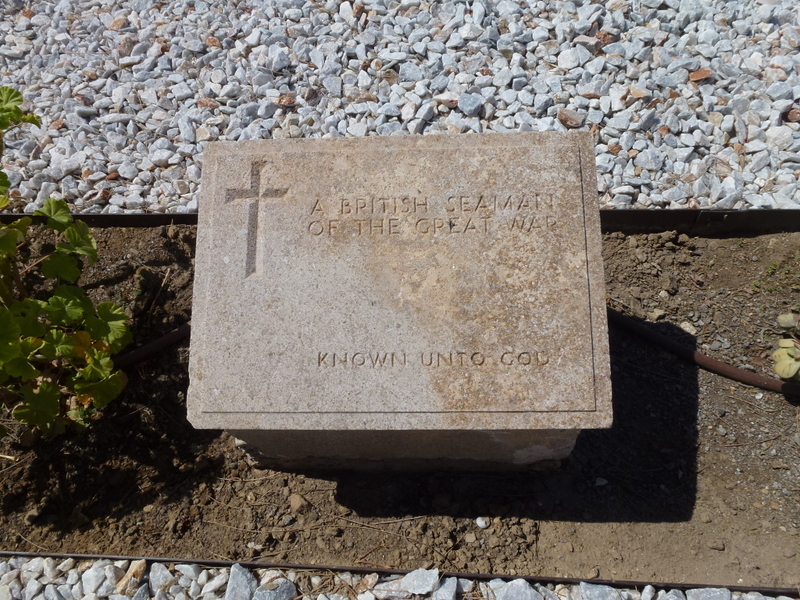 British war graves were to be found on several islands of the Cyclades, mostly containing the bodies of sailors and soldiers washed ashore from torpedoed ships. Many came from the sinking of the transport ship ‘Arcadian’ on April 15th, 1917. 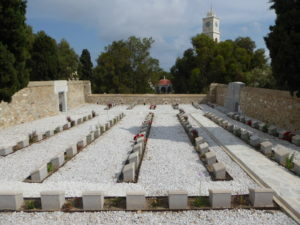 In 1921, the small ‘Syra British Cemetery’ was extended to take the scattered graves from all the islands. It contains 111 British graves including those of 30 sailors. 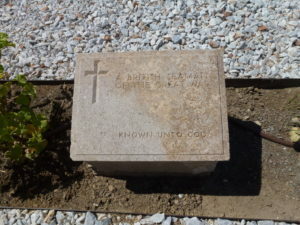 See the Commonwealth War Graves Commission website for detailed information. 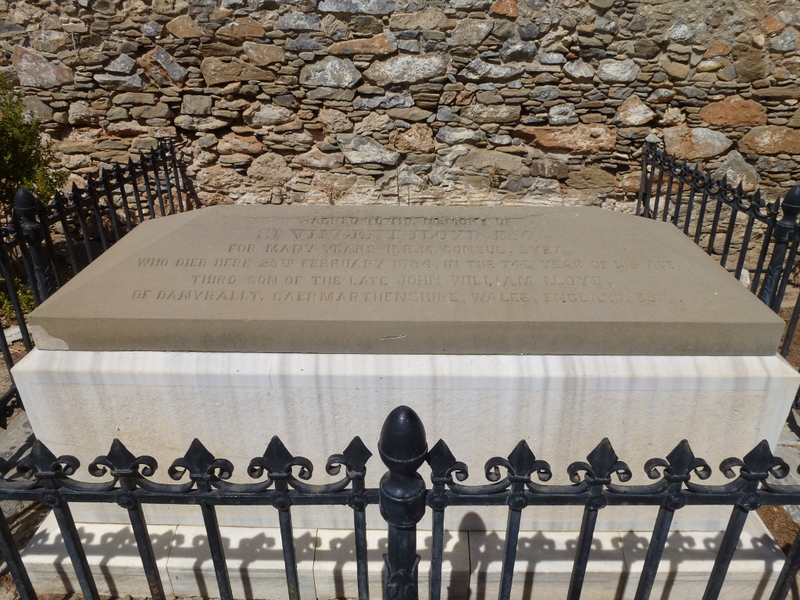 I never managed to find the final resting place of that last man buried in the Langada cemetery – maybe you can be more successful – let us know. 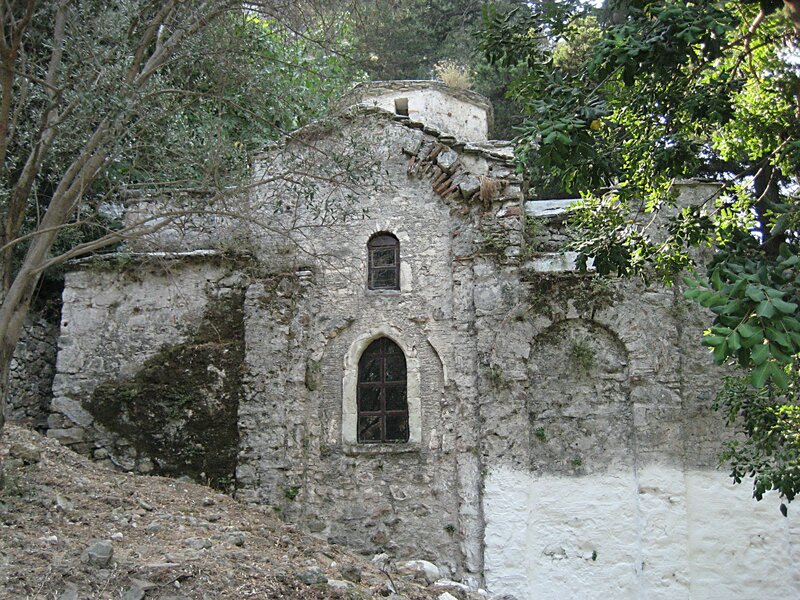 Panagia tou Potamiou, Samos, near where the Bents camped while looking for antiquities in 1886. Anyone in the group heard of the Bents? Got a moment? 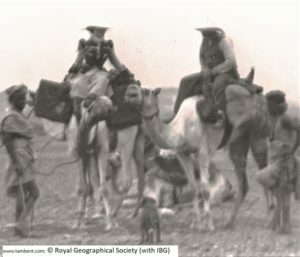 Englishman J. Theodore Bent (1852-1897) and his wife Mabel (1847-1929) were among the most widely travelled of British explorer/antiquarian duos of the second half of the 19th century – their expeditions covered Africa, Arabia, the eastern Mediterranean, and, of course Samos! The Bents had made their first visit, a brief one, to the island, then Turkish, over the winter of 1882/3, arriving on the lovely Austrian/Lloyd vessel the ‘Niobe’. This was as part of a trip, touristic really, that took in the great sights of the East Mediterranean. 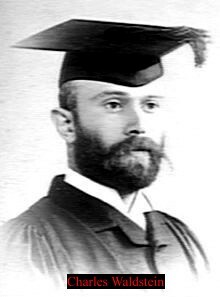 Theodore had read History at Wadham and was engaged in Italian/Genoese studies. He wrote three monographs on things Italian, but focussed on Chios and Samos for two articles penned following his first visit there: ‘A Visit to Samos’ (‘Academy’, Issue 579 (1883: June), p. 408) and ‘Two Turkish Islands To-day’ (Macmillan’s Magazine (Issue: 48 (1883: May/Oct.) pp. 299-309). These are well worth tracking down, the latter being highly critical of Turkish rule – and the taxing conditions the islanders faced after a devasting earthquake – and raising letters to the ‘Times’ and questions in the ‘House’, both grist to the mill for the young Bent (although, unsurprisingly, the Turkish authorities were suspicious of him ever after). 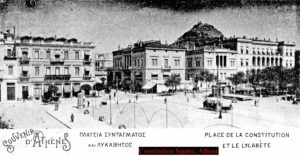 But that was three years ago, as it were, in terms of Theodore and Mabel’s next visit to Samos, now arriving at the end of February 1886, in Mabel’s words, ‘on a… little Greek steamer, the Anatoli’; Mabel was a snob at times. 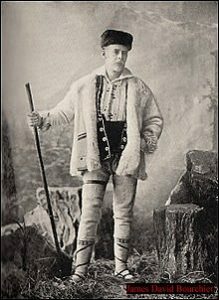 By the end of 1885, Theodore’s professional career had turned a corner – he had transformed himself into a budding archaeologist/explorer (today he would be fronting the cameras). In 1883/4 he had famously circled the Cyclades, digging on Antiparos and writing a bestseller on the eponymous isles. 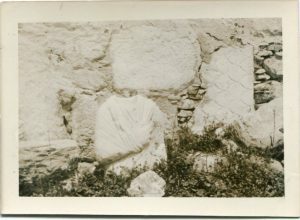 A year later, with his wife by his side as always (and by now the expedition chronicler and photographer), he had ‘excavated’ in the Dodecanese, removing – there is no other word for it – some lovely things from Karpathos, now in the British Museum. Following the successes of their 1885 programme, the Bents decide the next season to cruise down through Turkish waters, revisiting Samos along the way. Theodore, now a member of the council of the Hellenic Society, had obtained a grant of £50 to equip his expedition. 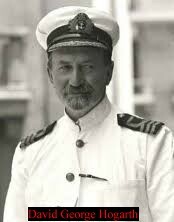 Once on Samos, however, he encountered problems with the authorities, repercussions from his undiplomatic behaviour three years previously; the Hellenic Society’s journal of 1886 reports that, ‘owing to unexpected difficulty in obtaining permission to dig in the island, Mr. Bent has not been so successful as he had hoped. 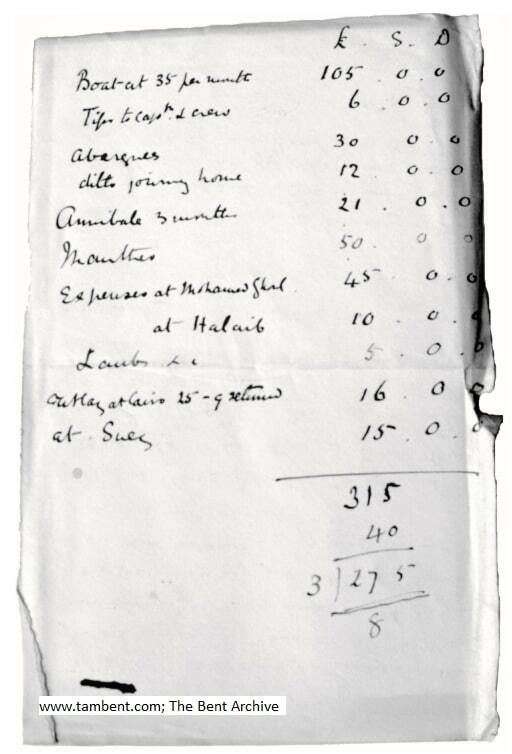 He has, however, spent only half the amount.’ The £25 was returned to the Society. Mabel informs us: ‘Truly the balmy days of excavators are over’. 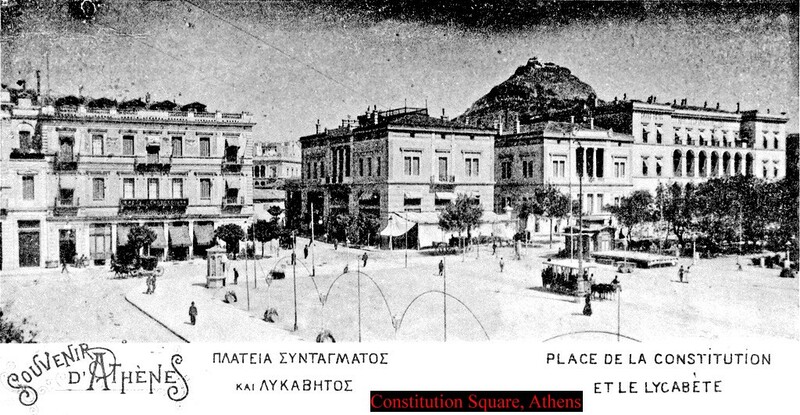 Theodore sketched out his Samos experience in the ‘Athenaeum’ (June 12, 1886), but his longer article was for the ‘Journal of Hellenic Studies’ (Vol. 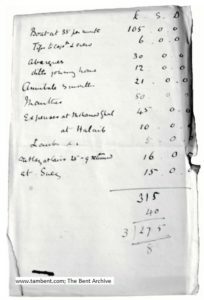 7, 1886, pp. 143-153), under the title ‘An Archaeological Visit to Samos’. It’s not so hard to find online. 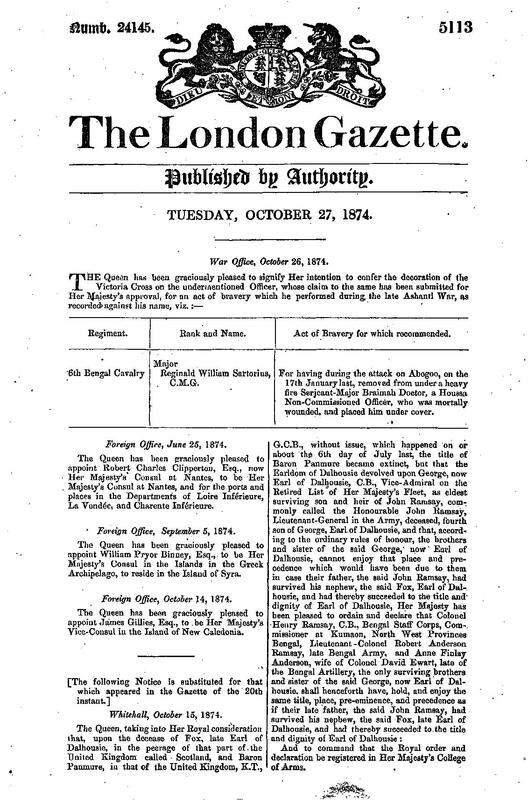 He begins his introduction: ‘English enterprise in excavation has been considerably checked of late years by the impossibility of obtaining anything like fair terms from the Greek or Turkish governments… Con-sequently if English archaeologists wish to prosecute re-searches on the actual soil of Hellas, it remains for them to decide whether they are sufficiently remunerated for their trouble and outlay by the bare honour of discovering statues, inscriptions, and other treasures to be placed in the museum of Athens, or, as is the case in Turkey, for the inhabitants to make chalk of, or build into their houses.’ Theodore was piqued: ‘[Though] I tried hard to obtain a concession for taking away one half or one third of the things found I was eventually obliged to sign the same agreement which the French excavator M. Clerk had signed two years before, and which stipulated that everything found should belong to Samos.’ And quite right too of course. 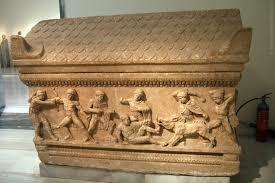 The British Museum also has ten or so of Theodore’s Samian finds, which it seems he must have smuggled out. He presented a fine terracotta Satyr mask dated c. 500 BC (1886, 1204.2) (illustrated here) and a glass aryballos (1886, 1204.1), but it seems the other material wasn’t sufficiently interesting to the museum and remained in Mabel’s possession until she donated the items in 1926, a few years before her death. Most of them are not on show but details of them are easily seen in the BM database – just search under ‘Theodore Bent’, for hundreds of his items from the E Med, Arabia and Africa. The Satyr mask collected by the Bents from Samos and now in the BM. All in all, Theodore and Mabel (ably assisted by their long-suffering dragoman, one Matthew Simos from Anafi), spent about eight weeks on Samos and around; after a few days on the island they took themselves off to Fourni, Patmos, Kalymnos, Ikaria and elsewhere, before returning to Samos to more or less circumambulate the island (the trip to feature in detail in a second post) in search of items archaeological, ethnographical, and other things generally ending in ‘cal’, including ‘gastronomical’, as Mabel notes once in Tigani: ‘We had coffee and jam first and then a splendid luncheon: soup of rice, whipped eggs and lemon juice, really good, a chicken and some lamb out of the same, Yaprakia, rice and meat in little balls boiled in vine leaves, very good rissoles, yaourt (curdled milk), cheese and fruit. I have not had so good a meal for a long time.’ [‘The Travel Chronicles of Mrs J. Theodore Bent. Volume I: Greece’, 2006, p. 84]. Mabel jotted most of these reminiscences in her ‘Chronicles’, a twenty-year series of notebooks now archived in the Hellenic Society in London and published in three volumes. 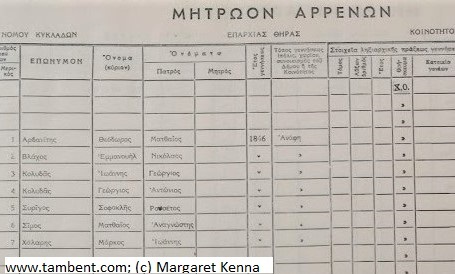 Here is bucolic entry for April 1886: ‘I spent the afternoon on the bed with my work and book… while Theodore went an hour and a half to inspect a place for digging at Panagia tou Potamiou, or ‘of the river’. He decided it was such a lovely place that we must try there, so on the morning of April 16th  we embarked in a boat and in half an hour reached the mouth of a river and soon pitched the tent on a flat place under some olive trees by a rushing river in a most lovely gorge… Just above our tent is the old church with some old pillars in it; not fine work. 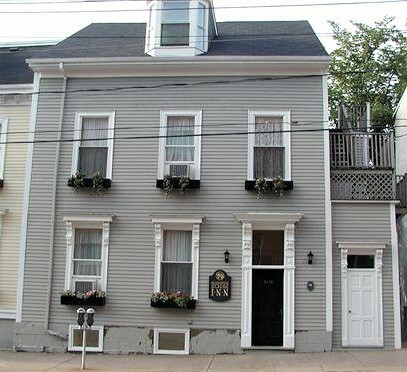 Here Matthew made a little stone table and it was our dining room and pantry, but not a very good pantry as the church mice, having plenty of candles to eat, are a thriving race… There is a water mill near, shut up at night. The digging was, I grieve to say, not successful. 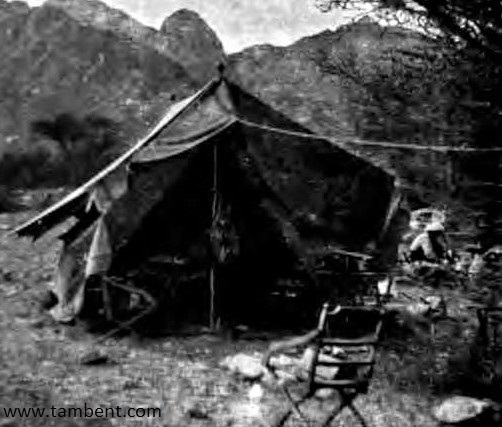 Theodore thought he had got among some Hellenic cottages; temples, palaces and statues were not to be found, only a large smashed marble pan of unknown use, so after 2 most delightful days in every way but the archaeological, we struck our tent and departed…’ [‘The Travel Chronicles of Mrs J. Theodore Bent. Volume I: Greece’, 2006, pp. 162-3]. Among the characters encountered on this tour was fellow Oxfordian Henry Fanshawe Tozer. 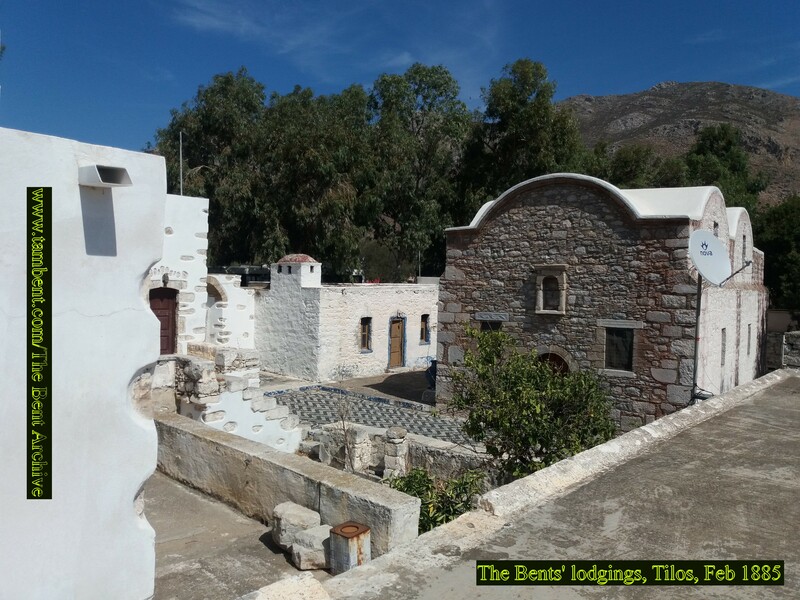 Tozer (in ‘The Islands of the Aegean’, 1890, p. 165) recalls their meeting and that they shared the same lodgings at Tigani: ‘We had the pleasure of meeting Mr. and Mrs. Theodore Bent, who occupied other rooms in the same building; they were engaged in excavating some of the tombs that lie outside the city walls’. Elsewhere in his book (p. 302) Tozer refers to ‘the indefatigable spade of Mr. Bent’ – no under-statement. 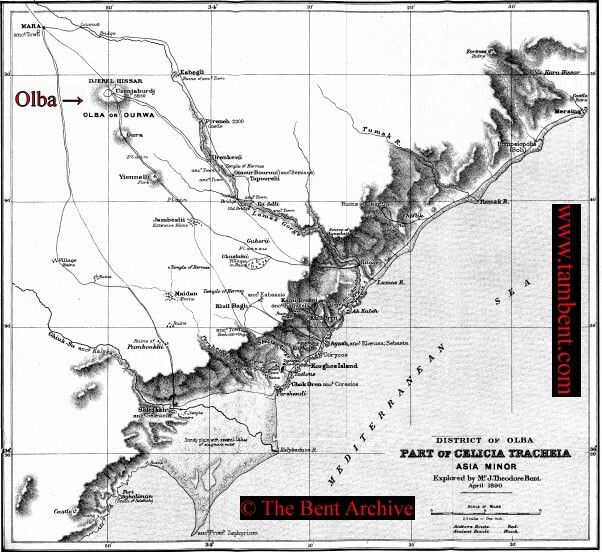 The Bents, following trouble with pirates (also to feature in a later post, if you’ve stuck with us this far), leave the island from Vathi in early May 1886, arriving home to their Marble Arch townhouse by the end of the same month. 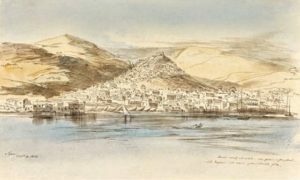 Theodore has a fever he thinks he contracted in the marshes of Samos: a cautionary reminder of the risks to health present in the Mediterranean and further east; that spring there was cholera and death in Brindisi, Trieste, and, of course, Venice. A recent post on the ‘Friends of Tilos’ (Dodecanese, Greece) Facebook page is very much worth re-posting here! Read on! “Anyone heard of the Bents? J. Theodore Bent (1852-1897) and his wife Mabel (1847-1929) were among the most widely travelled explorer/antiquarian duos of the second half of the 19th century – their expeditions covered Africa, Arabia, the eastern Mediterranean, and, of course Tilos! “Bent went on to write that the objective of their stay was to record an imminent wedding (very unlike the French one witnessed the other month by the present writer, and many thanks to Ian Smith for the raki by the way – a pleasure to meet him and his dog walking in Megalo Chorio), but actually Bent was there to see what he might dig up. He excavated at a couple of unspecified cemeteries but left with very little, the best of the finds had been removed decades before by men like Charles Newton (a search under ‘Telos’ in the British Museum’s database will show some of the magnificent vases that once graced the island, indicating its prestige in the centuries before Christ). 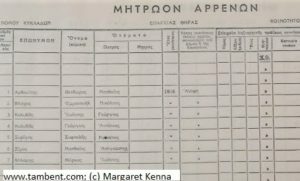 Bent’s account, for those interested, and worth the tracking down, was published as ‘The Islands of Telos and Karpathos’, ‘Journal of Hellenic Studies’, 1885, Vol. VI, pp. 233-242. 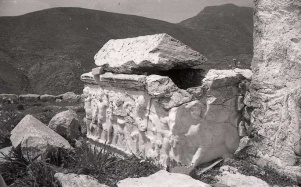 The fifth in Professor Margaret Kenna’s Theodore and Mabel Bent-related series of ‘incidentals’ covering the Cycladic island of Anáfi is all to do with the great monastery site at the western end of the island; that celebrated monument built on the foundations of an ancient temple that perhaps sanctified the locale where Jason and Medea sported – having landed safely in a terrible storm from Crete. But Prof Kenna will fill you in… Margaret is a retired social anthropologist from Swansea University who has been carrying out research on Anáfi, and among Anáfiot migrants in Athens, since 1966. She has written two books and many articles in English about her research: Greek Island Life: Fieldwork on Anafi (2nd edition 2017, Sean Kingston Publishing), and The Social Organisation of Exile: Greek Political Dissidents in the 1930s (2001, Routledge). A Greek translation of the second book was published in 2004 by Alexandreia Press. Many of her articles, in English and in Greek translation, can be found on the websites: academia.edu and ResearchGate. She has also written several booklets which can be found in tourist shops on the island: Anafi: a Brief Guide; Anafi: Island of Exile; The Folklore and Traditions of Anafi, and The Traditional Embroideries of Anafi. She was made an Honorary Citizen of the island in 2006. This fifth ‘talk’ in Professor Kenna’s thyme-scented series happily coincides with one of Margaret’s regular trips to the island (early June 2018). Go search her out if you are there! We very much hope you enjoy it and will look out for forthcoming Anáfi ‘talks’ soon on our site; by all means send in your comments to the Bent Archive! “On January 10th 1884, the Bents went by boat along the south coast of the island with their host, the ‘demarch’ Chalaris, and their guide Matthaios, to the Lower Monastery ‘of Kalamiotissa, on a promontory’, as Mabel writes. 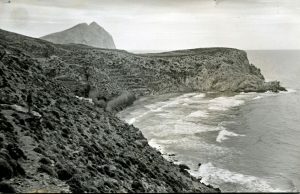 She does not mention the huge peak (1476 feet/ 459 metres) of Mount Kalamos above it, although Theodore does: ‘a gigantic mountain rock’ (1885: 50). Fig. 1: Mount Kalamos, in the distance, at the eastern end of the south coast of Anafi (M. Kenna). “A bit of dynamite fishing from rocks along the south coast took place during the boat trip. Mabel writes the initial of the person involved, Theodore tactfully says ‘one of our men’, for then, as now, dynamite fishing is illegal and extremely dangerous. In the 1960s many male villagers had missing fingers or limbs (dynamite was not mentioned to me in the explanations I was given for these injuries), and in the 1980s, two Anafiot men, a father and son, were killed while using it. 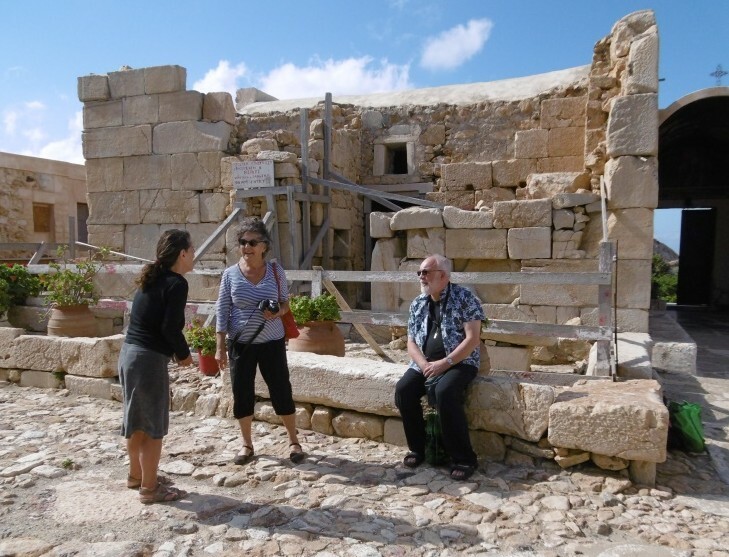 “All that Mabel says of their visit at the monastery is this: ‘The Monastery is a very curious place, built on the site and with the stones, and using much of the old building of a temple of Apollo’ (for the diary references, see Bent, M. 2006: 32-34). “The church of the Lower Monastery and the monks’ cells are indeed built inside the ruins of an ancient temple of Apollo. The myth is that Jason and the Argonauts were caught in a storm and saved by a flash of light thrown by Apollo, revealing the island to them (one derivation of the island’s name is ‘Revelation’, a parallel to another island sacred to Apollo, Delos, a name which also means ‘to reveal’). Anafi was later a place of pilgrimage to the temple of Apollo, and to other temples built on the site, and became rich enough to have its own coinage. 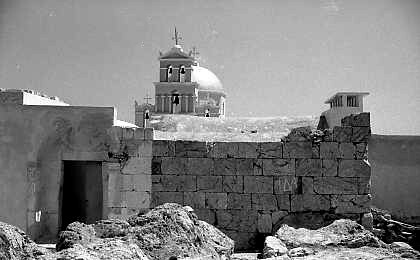 Fig 2: The Lower Monastery church visible over the wall of Apollo’s temple, summer 1966 (M. Kenna). 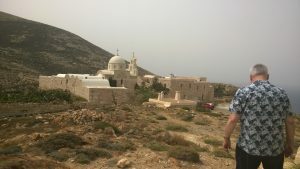 “The Monastery is called ‘Lower’ because there is another very small one, founded in 1715, on the peak of Mount Kalamos. 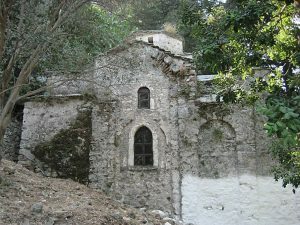 Until 1887 the ikon of the island’s patron saint, Panayia Kalamiotissa (the Virgin of the Reed), was housed in the Upper Monastery chapel, and it was then brought down to the Lower Monastery. The Lower Monastery had been visited by Ludwig Ross in the 1830s (probably on the same visit as the one on which he sketched the sarcophagus described in another blog entry) and a decade later the archaeologist and epigrapher Hiller von Gaertringen would not only visit the Lower Monastery (because of his interest in the temple) but also photograph it, and the Upper Monastery chapel as well. 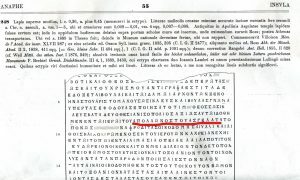 He published the Anafi inscriptions in Inscriptiones Graecae Vol XII, 3: 54-68, numbers 247-319 (referred to here as I.G.). 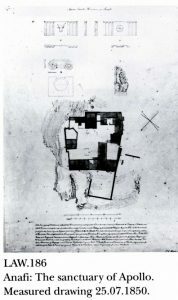 A photocopy can be found in the museum in the village. Fig. 3: Hiller von Gaertringen’s photo of the Lower Monastery during his visit, c. 1898. Fig. 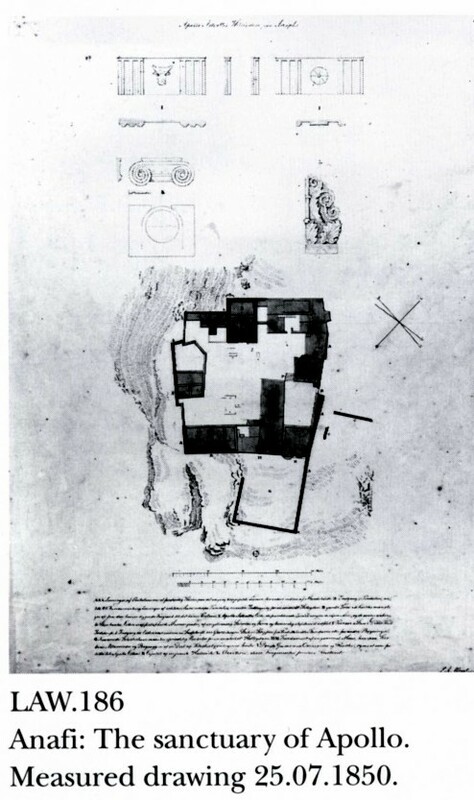 4: A ‘measured drawing’ by Laurits Winstrup, Danish architect, of the layout of the temple and monastery buildings. The wall in the photo above is at the top of this drawing (from Margit Bendtsen ‘Sketches and Measurings: Danish Architects in Greece, 1818:1862’. Copenhagen, 1993: 361). “At the time of the Bents’ visit, the three monks there were mourning the death of their Abbot the previous day (how Chalaris had not heard of this is not mentioned), so the Bents did not stay long. 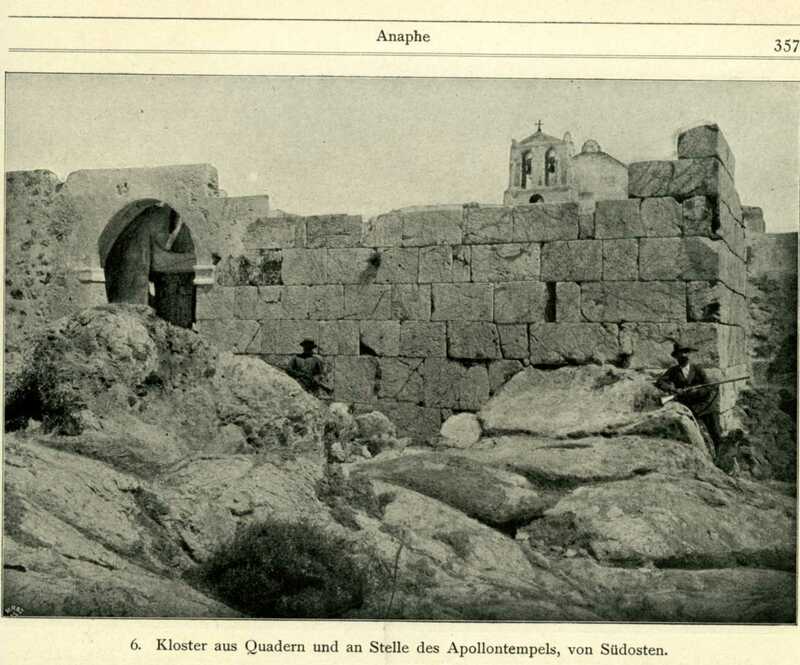 Theodore does however mention that ‘the monastery now belongs to one at Santorin’ (1885: 50). Later events make it clear that another Abbot was appointed, and, indeed, there was one during my own time on the island (when there no monks at the Lower Monastery) who also acted as village priest. 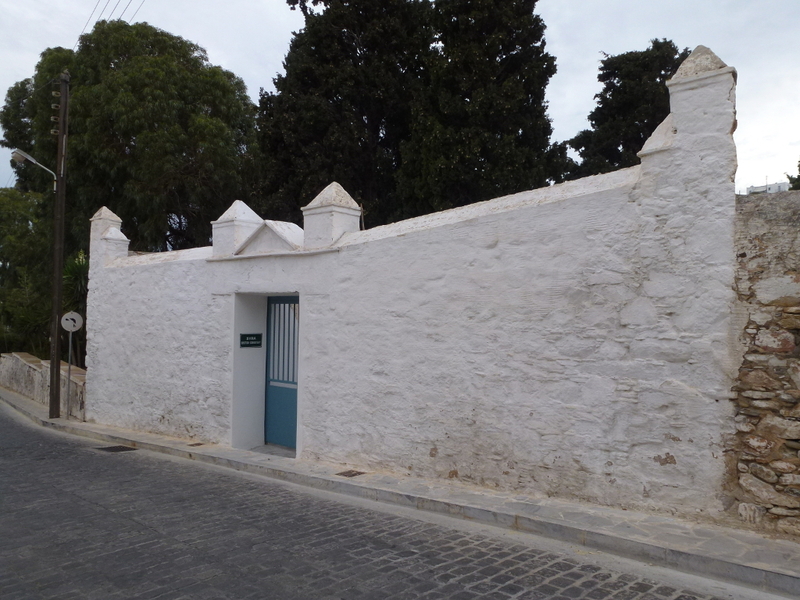 It was only after this Abbot’s death in the 1990s that the Lower and Upper Monasteries became ‘holdings’ of the Monastery of Profitis Ilias on Santorini, and renovations were carried out and other changes made. Fig. 5: The Lower Monastery in 2016. Part of the ancient wall can just be seen bottom left (M. Kenna). Fig. 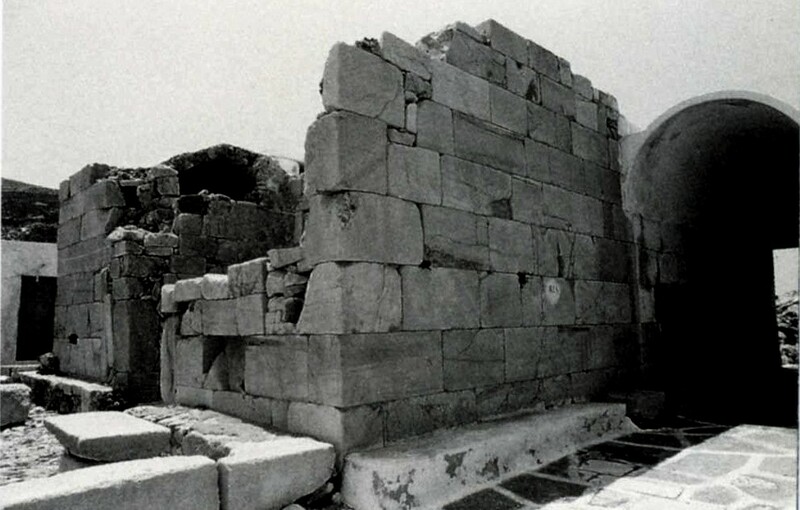 6: Inside the Lower Monastery, showing the wall of one of the temple buildings, summer 1966 (M. Kenna). Fig. 7: The temple building in the photo above, summer 1988 (M. Kenna). Fig. 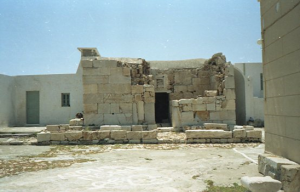 8: The temple building ‘secured’ by the regional archaeological service (21st Ephorate), 2015 (M. Kenna). Fig. 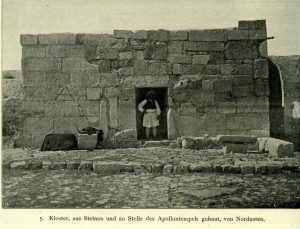 9: Hiller von Gaertringen’s Greek foreman (Angelos Kosmopoulos from the Peloponnese, wearing a fustanella), in the doorway of the remaining temple building, 1898. “Theodore refers to Apollo in the god’s manifestation as ‘Aeglites’ (‘radiant’ ‘shining’). 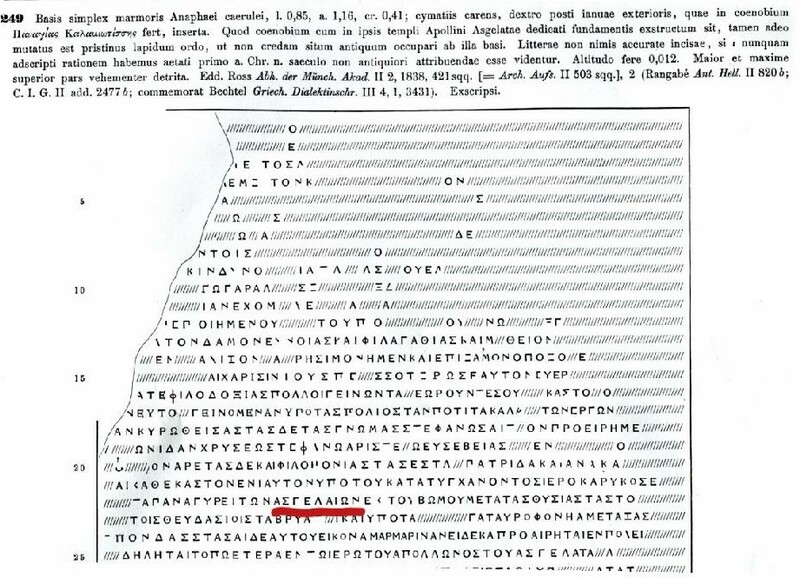 However, Apollo on Anafi had an epithet that is unique to that location, which appears in some of inscriptions which Hiller recorded. This epithet is ‘Asgelatas’. Some scholars say this is a variant of ‘aigletes’, radiant, and others relate it to Asclepios/ Aesculapius, god of healing, son of Apollo – so would the epithet mean ‘father of Asclepios’? There are other more controversial interpretations, see ‘Apollo and the Virgin’ in History and Anthropology 2009, available on the websites: academia.edu and ResearchGate. Theodore would surely have known about this epithet as Ludwig Ross had described it (see line 3 of the text in I.G. XII, 248, below). Fig. 10: One of the inscriptions referring to Apollo as ‘Asgelatas’ (I.G. 248, line 8). 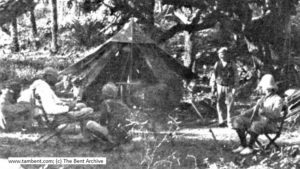 “In the summer of 1966, Richard McNeal visited the island and discovered another such inscription, not recorded by Hiller. 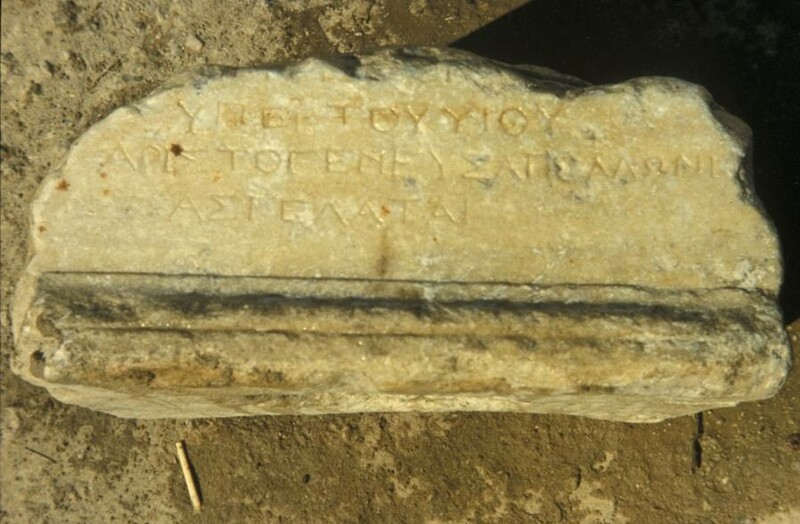 It is a dedication of an altar and reads, in translation, ‘To Apollo Asgelatas, on behalf of (my) son Aristogenes’. He asked me to take a photograph of it and to make a ‘squeeze’ (papier-maché impression). 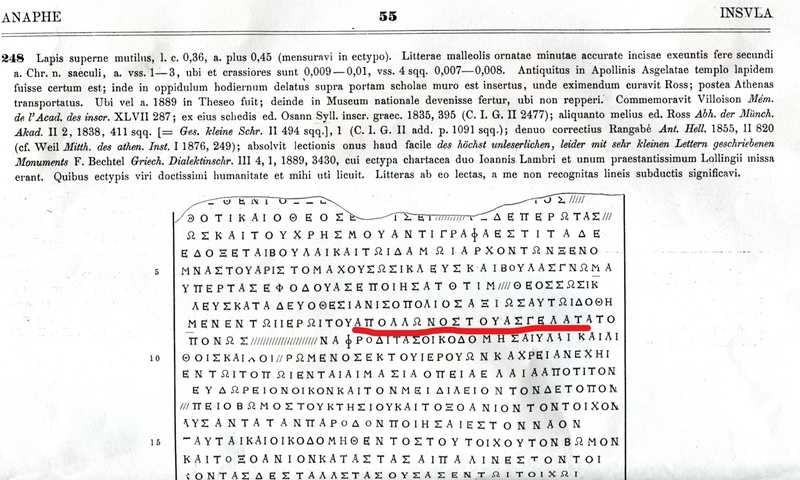 The Greek word ‘Asgelatas’ is in the third (last) line. Fig. 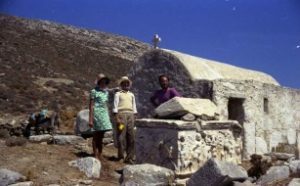 11: The ‘Asgelatas’ altar, summer 1966 (M. Kenna). Fig. 12: An inscription recorded by Hiller, mentioning the ‘Asgelaia’. I.G. 249, line 22. “And what they were, we don’t really know – although they could be an occasion at which men and women traded insults, repeating what is said to have taken place on Anafi when Jason and the Argonauts were insulted by Medea and her women. The women derided the men for only having water (instead of wine or oil) to pour on the sacrificial fire offered to Apollo in thanks for their safe arrival on the island (as reported by Apollonios Rhodios in Argonuatica Book IV, line 1730). “Theodore notes that at the Lower Monastery, ‘In every direction are to be seen inscriptions let into the walls…. It would appear from the inscriptions that this ground was once covered with temples, the principal one being dedicated to Apollo Aeglites, another to Aphrodite, another to Aesculapius, etc.’ (Bent 1885: 50). 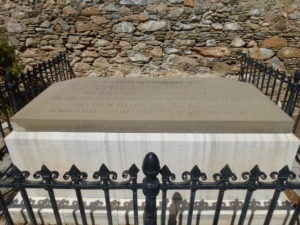 His work on the inscriptions appears in another ‘blog’ entry (‘Incidentally II’) . “Of course, and as ever, far the best thing to do is go see for yourselves! The road there is excellent – you can hire a car, scooter, or bike, but the joy is in the walking – there is a coastal path – and in front of you all the way is the tempting and high Kalamiotissa church in the distance. Go on, you can do it! The fourth in Professor Margaret Kenna’s Theodore and Mabel Bent-related series of ‘incidentals’ covering the Cycladic island of Anáfi, centres around a well-known landmark you can easily find on the way to Kastelli, the hill on which the Hellenistic city ruins can be found. Thus Margaret’s third short ‘talk’ in her thyme-scented series is called: ‘“The sarcophagus” at the Bents’ time, earlier, and more recently’. 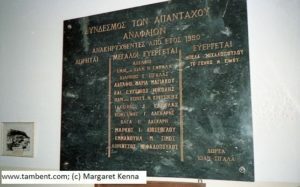 Margaret is a retired social anthropologist from Swansea University who has been carrying out research on Anáfi, and among Anáfiot migrants in Athens, since 1966. She has written two books and many articles in English about her research: Greek Island Life: Fieldwork on Anafi (2nd edition 2017, Sean Kingston Publishing), and The Social Organisation of Exile: Greek Political Dissidents in the 1930s (2001, Routledge). A Greek translation of the second book was published in 2004 by Alexandreia Press. Many of her articles, in English and in Greek translation, can be found on the websites: academia.edu and ResearchGate. 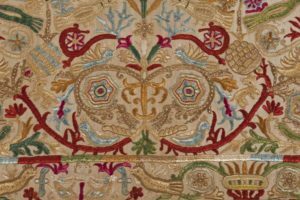 She has also written several booklets which can be found in tourist shops on the island: Anafi: a Brief Guide; Anafi: Island of Exile; The Folklore and Traditions of Anafi, and The Traditional Embroideries of Anafi. She was made an Honorary Citizen of the island in 2006. 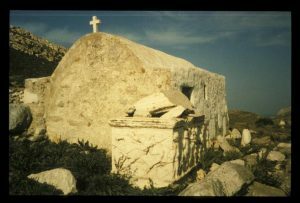 “On the way to Kastelli, the hill on which the Hellenistic city ruins can be found, the Bents came to ‘a little church’ (the chapel of Panayia tou Dokari), next to which is a marble sarcophagus. 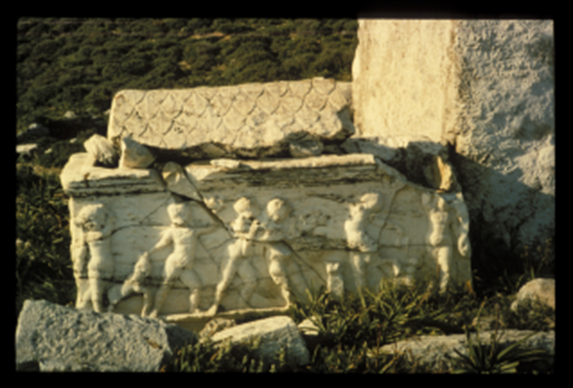 As Bent records, there is on one side, ‘a beautifully executed representation of children bringing sacrifices to Bacchus…. 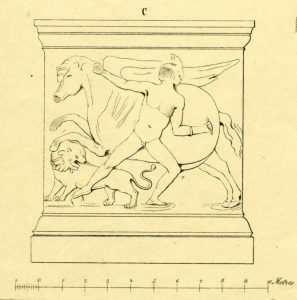 On the other side are Bellerophon and Pegasus, and on the two narrow sides are Sphinxes.’ (Bent 1885: 47). Actually, not quite correct, as these photos will show….. Figure 1: The sarcophagus outside the chapel of Panayia tou Dokari in summer 1967 – Sphinx on short side (east-facing), jolly cherubs on long side (south-facing) (M. Kenna). Figure 2: The jolly cherubs in late afternoon sunshine (M. Kenna). Figure 3: Hiller von Gaertringen’s photo of the jolly cherubs, 1898 (IG XII/3). Figure 4: In summer 1973, Bellerophon and Pegasus on short side (west-facing), jolly cherubs still jolly (M. Kenna). Figure 5: Bellerophon and Pegasus in late afternoon sunshine (M. Kenna). 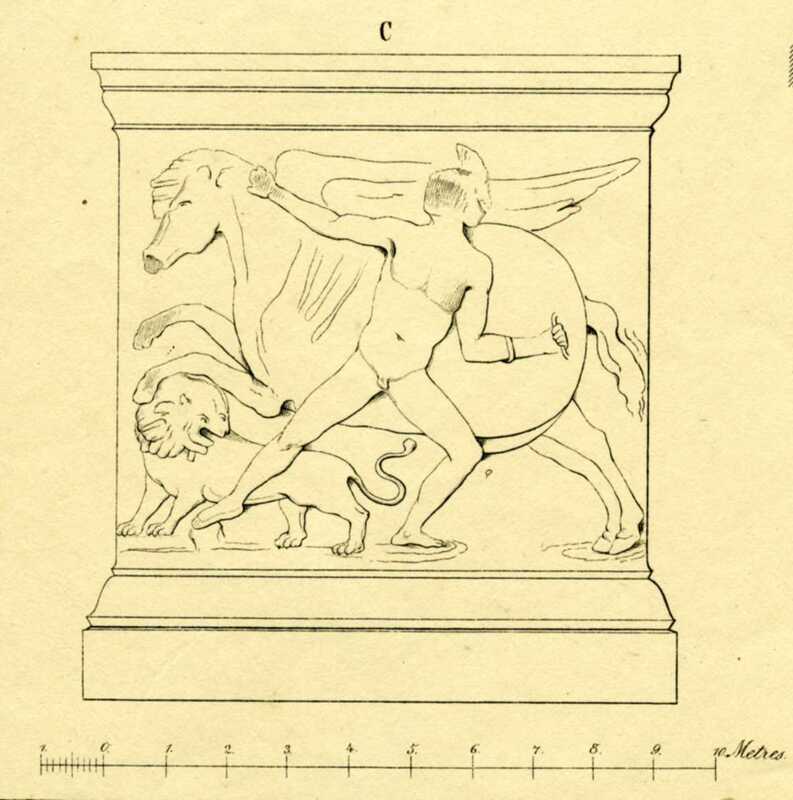 Figure 6:…easier to see in Ross’s early C19 drawing of the west-facing side of the sarcophagus (Ross 1840-1852). 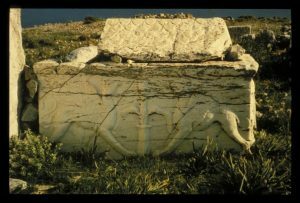 Figure 7: Not a sphinx, but winged griffins either side of a pillar, on the north-facing side (M. Kenna). 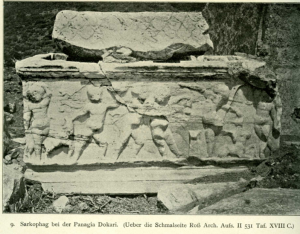 “Another sarcophagus was probably in the same location, as fragments of the decorated ‘roof’ can be found built into the wall of the chapel. 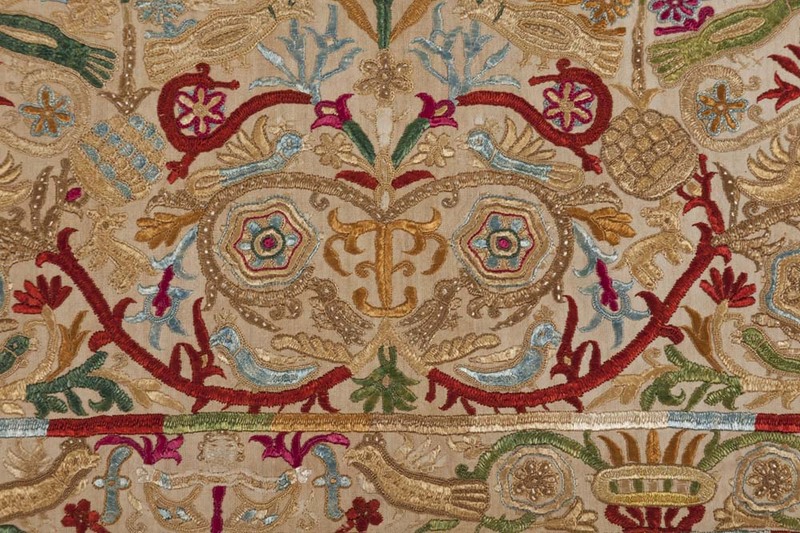 Bent writes that this other one ‘appears to have been even richer in execution’ (Bent 1885:47). Figure 8: Fragment of the roof of ‘the other sarcophagus’ (to the right of the headless statue), built into the chapel wall, spring 1967 (M. Kenna). 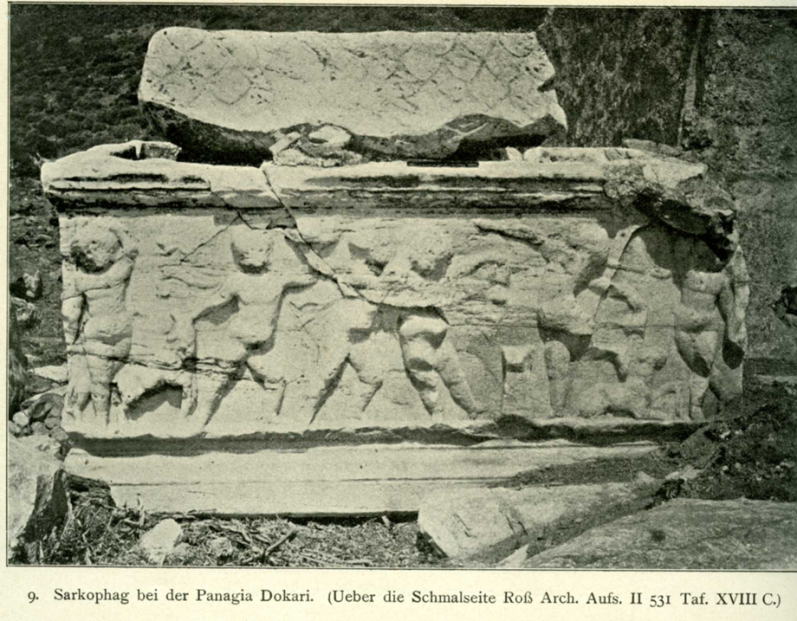 “There is a sarcophagus (Figure 8) of a similar type in the National Archaeological Museum found in Patras in the Peloponnese, dated around 150 A.D./ C.E., which gives an idea of what the Anafi sarcophagus might have looked like. The scene depicted is a boar hunt. Figure 9: Item 1186, National Archaeological Museum, Athens (M. Kenna). Bent, Mabel and Brisch, Gerald (ed.) 2006. 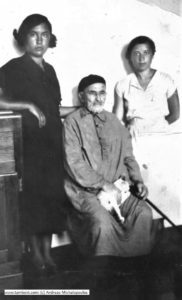 The Travel Chronicles of Mrs. J. Theodore Bent, Vol I: Greece and the Levantine Littoral. Oxford, Archaeopress. Bent, Theodore 1885 (2002). The Cyclades, or Life Among the Insular Greeks. Oxford, Archaeopress. Hiller von Gaertringen, F. 1898. Inscriptiones: IG XII/3. 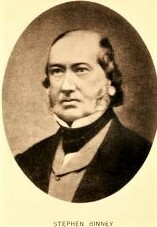 Ross, Ludwig 1840-1852. Reisen auf den griechischen Inseln des ägäischen Meeres (1840-45). Stuttgart, Tübingen, Cotta [https://archive.org/details/reisenundreiser00rossgoog].